Tenet Healthcare & Abrazo Heart Institute have an opportunity for a medical cardiologist looking for an opportunity within an established, reputable and expanding group. Our opportunity is full-time, minimum 40 hours a week, employed within our large multispecialty TPR group and based at Abrazo Arizona Heart. The group does outreach at a clinic in Casa Grande, AZ and time will be split between these two locations. Must have M.D. or D.O. If interested, please apply with a copy of your current CV. Applications without a CV will not be reviewed. No visa sponsorship is available at this time. Our TPR employed contract offers you a competitive salary with a productivity incentive, a comprehensive benefits package and an enjoyable modern work environment. Benefits include PTO, 401K, sign-on bonus, comprehensive medical/vision/dental insurance and more! A heart attack is one of the scariest and most common health problems you can face, and also one of the most treatable. 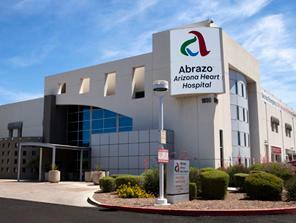 Abrazo Arizona Heart Hospital, a satellite of Abrazo Arrowhead Campus, has 300 physicians dedicated to your heart care in a smaller hospital setting that is both attentive and experienced. Heart Attack survivor, Bruce Cooper explained, "They used their expertise in watching and guiding me back to health". When it opened in 1998, Abrazo Arizona Heart Hospital was the first hospital in the U.S. dedicated to heart disease, and it quickly became one of the world’s leading cardiac care centers. We could have expanded into other service lines, but we chose instead to commit ourselves to excellence in heart care. As in 1998, we focus on the heart, and you’ll feel that experience when you walk in our doors.